A small roadside Ojizousama. Photo by Bonguri. One thing that strikes me every time there is a major election in the United States is how much importance is placed on religion (宗教　しゅうきょう　shuukyou). This never happens in Japanese elections (and rarely in elections in the European countries I've lived in for that matter). Most people in Japan would probably identify themselves as 無宗教　むしゅうきょう　mushuukyou - non-religious. Most people practice various rituals that are from 神道　しんとう　shintou - Shinto, but because they are so ingrained in Japanese culture they are barely thought of as being religious in nature. Rituals and practices from 仏教　ぶっきょう　bukkyou - Buddhism are also ingrained in peoples' lives. Although the percentage of Japanese people who identify themselves as クリスチャン　kurisuchan - Christian - is quite small, some キリスト教　きりすときょう　kirisutokyou - Christian (Christianity) practices have been incorporated quite casually. Here's how an ordinary person might encounter religious practices in their lives. Here's how a typical year might go for a Japanese person, with various rituals that are barely thought of as being that religious. They celebrate New Year's in a Shinto fashion, going to a 神社　じんじゃ　- Shinto shrine to pray for good luck in the upcoming year (this first visit of the year to the shrine is called 初詣　はつもうで　hatsumoude). There's even an online 神社. A big ceremony for people who reach 20, is 成人の日　せいじんのひ　seijin no hi - Coming of Age Day on January 15th, when they get dressed up in traditional kimonos (especially girls) and go to the 神社　again. 節分の日　せつぶんのひ　setsubun no hi in February is a sort of mixed Shinto-Buddhist day, when bad spirits are driven out by throwing beans while chanting 鬼は外！　おにはそと！ oni wa soto! - Out with the devils! Girl's Day, or 桃の節句　もものせっく　momo no sekku　in March is a Shinto festival of sorts. 七夕　たなばた　tanabata in July (though some places still celebrate it in August, following the old calendar) is another Shinto day, where people write wishes down on slips of paper (短冊　たんざく　tanzaku) and hang them from bamboo branches. In August, お盆　おぼん　obon is celebrated, when people pay homage to the memories of their ancestors (the most common way is to go back to their home towns and visit the graves of their deceased loved ones). Obon is largely Shintoist, but most people are buried with Buddhist rituals. Hallowe'en (ハロウィーン）has become a more popular thing to do in October, and around Christmas （クリスマス）time the stores explode with Christmas decorations. And many people get married in Christian churches. But Christian rituals seem to be mainly used for their decorative and 'romantic' aspects, rather than anything spiritual. Many homes have a small Shinto shrine (神棚　かみだな　kamidana, which literally means 'God's shrine'), if a close relative died there there may have a 仏壇　ぶつだん　butsudan - Buddha's shrine (Buddha as well as the deceased person being honored are called 仏様　ほとけさま　hotokesama) to honor their memory. 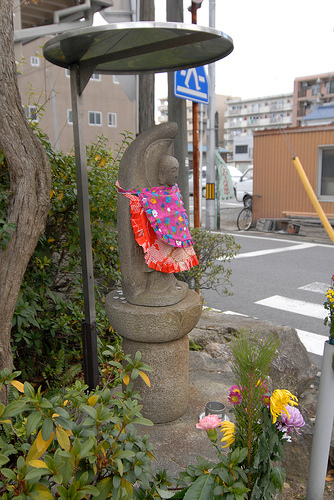 Many Japanese streets, in the towns or the countryside, have little stone statues called お地蔵様　おじぞうさま　ojizousama, a Buddhist 菩薩　ぼさつ　bosatsu or sort of saint who protects travelers and others. When children wish for good weather the next day, they might hang up a てるてる坊主　てるてるぼうず　teruterubouzu - the figure of a little bald Buddhist priest made out of paper. Throughout various periods in Japanese history, Christianity has been actively discouraged, banned or persecuted, and other religions have had little or no influence. Nowadays people are free to practice any religion they want, but the percentage of people who identify themselves as being of a particular religion is quite small. (The Japanese government doesn't ask people what religion they are formally so exact numbers are hard to come by.) Generally speaking, there is a feeling of slight suspicion towards anyone who is overly religious. For instance, there was a family in our old neighborhood in the suburbs of Tokyo who were active in 創価学会　そうかがっかい　Soka Gakkai, a relatively new Buddhist sect. The mothers in our neighborhood would warn the kids not to associate with them too much. I never understood why exactly, but I guess it comes from a general distrust of anyone who is too different from the norm. Perhaps Shinto practices have sprung up around お地蔵様, even though he's originally Buddhist? You are right, ojizousama is a Buddhist bosatsu. I've corrected the entry. I guess that in Japan people don't really stop to think if they are Buddhist or Shinto - they are just sort of benign beings looking over us. But Seijin no Hi is for those turning 20, not 21... did you change it to 21 so westerners would recognize it more? No that was a plain and simply typo. Corrected now! My mother was Soka Gakkai (i grew up in it), and it was viewed with suspicion by her sisters and brothers-in-law the two times i remember going there (read: old enough to remember going there!). They took me to a Nichiren shrine near Yokohama, and helped me work through the necessaries to visit Taisekiji, but always with warnings. And always with me assuring them (via my broken, childlike japanese and three dictionaries!) that i don't participate in their *activities*. Soka Gakkai is much more 'western' than other Buddhists sects, in that they have meetings and proselytise and generally teach only such Buddhist things as pertain directly to themselves, and i suspect many Japanese view members much as Americans view evangelising fundamentalist Christians. i no longer see myself as Soka Gakkai, but as generally Buddhist/Shinto. The difficulty for many westerners is, i think, the fact that spirituality is built into the Japanese culture and often *lived*, rather than relegated to one day a week.